Problem: You are making your website visitors think. I remember the first time I went to the Cheesecake Factory. The friendly waiter handed me and my date the menu, and told us he would be back in a few minutes to take our order. It was a first date so I was excited, but also a little anxious and nervous. I opened the menu and panic set in. There were more than 250 menu items to choose from. With so many choices I experienced a moment of paralysis. The combination of having to make casual conversation with my date, and having to choose something to eat from 250 menu items was more than my brain could handle. Turns out it’s not just me. Humans have a problem making decisions. The more options there are, the more likely we are to not choose any. In other words, too many choices is a bad thing. Humans are drawn to clarity and they resist confusion. I remember learning this in Psychology 101. Have you ever been to that website where you are bombarded with too much information, too many package options, and too many buttons to click? I know I was definitely guilty of this with my first website. 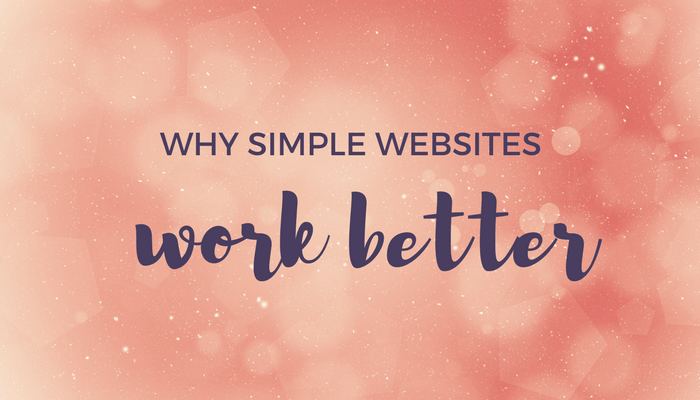 "What's the most important thing I should do if I want to make sure my website is easy to use?" The more mental effort someone has to put out to understand your website, the more likely they are to be confused and leave. Just like your computer slows down when you have too many programs open, so does the human brain. Simple, clear, and free of distraction. When people get to your website they want to find what they are looking for and find it quickly.